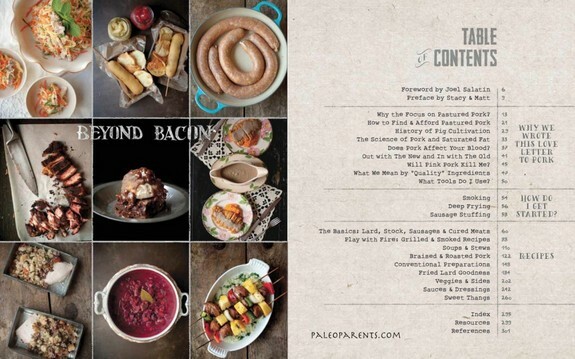 Most of you have probably heard of Stacy and Matt’s (Paleo Parents) much-praised cookbook treatise on pork, Beyond Bacon: Paleo Recipes That Respect the Whole Hog. Admittedly, I’m an unabashed pork lover. Today, coincidentally, we had bacon as part of our breakfast, soup that included bacon (and a little bacon grease) for lunch, and pork sirloin for our dinner. Pork is one of our favorite meats so you’ll often find pork dishes on our table. Spare ribs, country ribs, baby back ribs, ham, pork picnics, pork butts, pork shoulders, pork chops, pork sirloins, pork tenderloins, and pork belly (mostly in the form of bacon) have all graced my table with some frequency over the years. Interestingly enough, Baby Back Ribs are a meal that I can often eat safely free when dining out. Pork doesn’t need much to shine, so ribs in restaurants are typically either dressed in a dry rub or a simple sauce, both of which are usually gluten free. (Always check gluten-free status of all ingredients, of course!). There’s even a photo of baby pigs in our home (plus a few more pig items). Mr. GFE was a member of Future Farmers of America in high school and raised pigs. He’s always said there’s nothing cuter than a baby pig. He enjoyed the process of raising pigs and was very proud when he’d sell them. Still, all that said on our love of pork, Beyond Bacon really surprised and delighted me when I read it. I had no idea it would be so beautiful. Overall, it’s simply gorgeous—the photos of the pigs on the farms (and Matt and Stacy and their family visiting the farm) and the recipes made from the whole hog. I had no idea I would learn so much from this book either. ~ The chalkboard style cover (and other photos in that style) and the quotes filling the flyleaves of this book. The quotes are from folks you “know.” Folks like Julia Child, Joel Salatin, Alton Brown, Michael Pollan, and many more. Such quotes are actually used throughout the book and show that the wisdom shared in this book comes from many more folks than Stacy and Matt. ~ Joel Salatin’s Foreword—I was first “introduced” to Joel in Food, Inc. He is the Virginia farmer behind Polyface Farms in the Shenandoah Valley of our state. From their website: “Polyface, Inc. is a family owned, multi-generational, pasture-based, beyond organic, local-market farm and informational outreach in Virginia’s Shenandoah Valley.” You’ll want to read much more there. Joel calls Beyond Bacon a DIY for food preparation, processing, and packaging for pork. I love that! ~ The preface from Stacy and Matt—I never get tired of reading their family’s personal story of their dietary and lifestyle changes and recovery from so many health issues for all of them (except for their youngest son because he’s never had health issues due to Stacy’s improved diet when she was pregnant with him and his diet since his birth). ~ That their “love letter to pork”—what they call this book—celebrates pastured pork (pastured is best for the farm animals and us) and using the whole hog as indicated by its title. Over the years, most of us have become disassociated from the food we eat. Working with the actual source, the farmer, behind the pig and not just buying packaged bacon, packaged pork tenderloin, etc. should be a goal of all of us who eat pork, for so many reasons. ~ Info on ordering a whole pig including the Hog Anatomy Chart and breakdown of how to choose what to order. You get to select most of the specifics of your hog. And, again, no, you don’t order all bacon. You will learn about a lot of other items you can get from the whole hog and you’ll happily forego just getting bacon! ~ The new guidance on cooking pork that is shared in this book. The old guidance on cooking all pork to well done—which also meant it would end up very dry and not so tasty—was based on what pigs ate at the time. Trichinosis is now almost non-existent and tied to undercooked game, not pork. After attending one of the Paleo Meat-ups held at Stacy and Matt’s home, and sampling their Salted Caramel Bacon Sauce—also known as Bacon Jam—I immediately said that recipe was worth the price of this book alone. And I haven’t changed my mind on that. But tonight I made the Triple Chocolate Fudge. Holy! Mr. GFE, the man who usually resists sweets with no issue, had to keep sampling this fudge to be sure just how good it was. Oh my, it’s good … really, really good! “Death by chocolate” good. 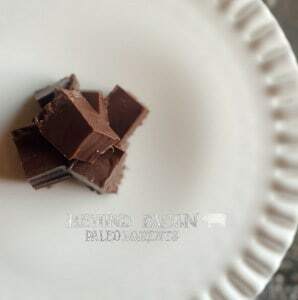 This recipe gives you the divine bittersweetness of dark chocolate and a mix of wonderful textures—all from just a few simple ingredients! Getting this recipe, too, is alos worth purchasing this book (if you don’t win it, of course)! Because this fudge is so incredibly good, if you don’t have a lot of folks living at your house, I recommend making it when you have a small crowd around. One piece is just the right serving size, but you won’t be able to resist having more of this dessert. If it’s there, you will definitely eat more than one piece. You have been warned! Courtesy of Paleo Parents and Victory Belt Publishing, you can find the recipe at the bottom of this post. UPDATE: This giveaway is now closed. Congratulations to the winners and thanks to all who entered! 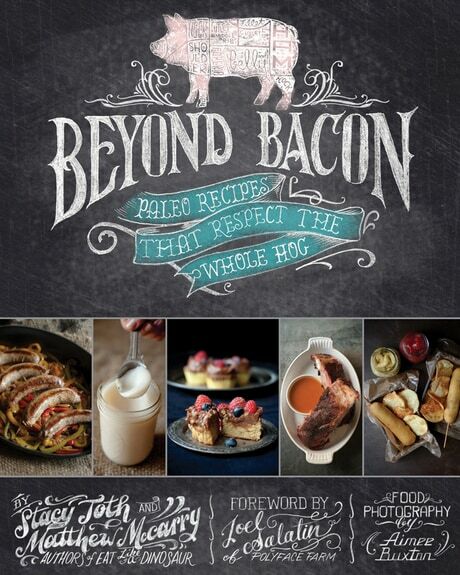 Three winners will win a copy of Beyond Bacon: Paleo Recipes That Respect the Whole Hog. But wait … two winners will also win a copy of Stacy and Matt’s first book, Eat Like A Dinosaur: Recipe and Guidebook for Gluten-Free Kids. (It’s one of my faves; you can read my earlier review here. Don’t misled by the name either. It’s not just for kids and families; even single adults have loved this book!) 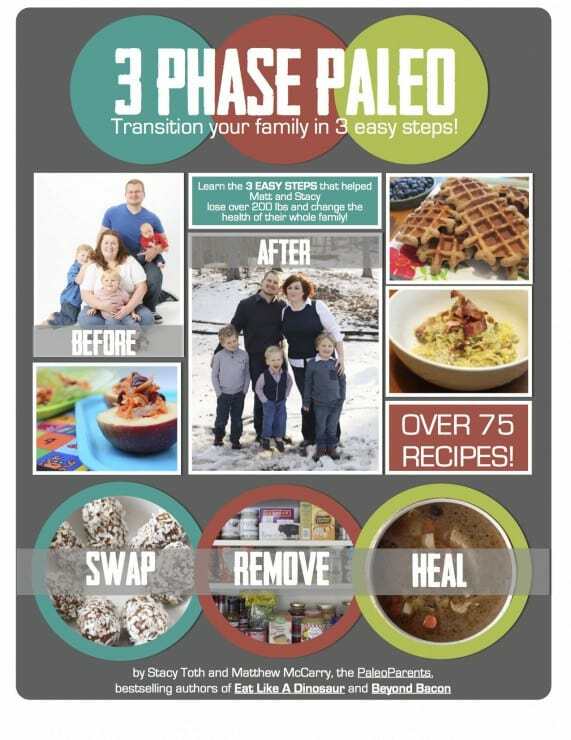 And wait once more because two winners will also receive a copy of Paleo Parents’ newest work, 3-Phase Paleo: Transition Your Family in Three Easy Steps, an ebook that does just that by teaching you how to “Swap, Remove, and Heal,” and also includes over 75 recipes! This giveaway ends Monday, February 24, at midnight Eastern. p.s. Be sure to also enter the other open SSS giveaways: Gluten-Free Entertaining: More than 100 Naturally Wheat-Free Recipes for Parties and Special Occasions (ends Thursday, February 20); Sweet Debbie’s Organic Treats: Allergy-Free & Vegan Recipes from the Famous Los Angeles Bakery (ends Saturday, February 22) and Sweet Cravings: 50 Seductive Desserts for a Gluten-Free Lifestyle (ends Saturday, February 22). An excellent make-ahead dish, this fudge should be served still cold. Over a double boiler, continually stirring, melt 1 1/4 cups of the chocolate chunks or chips. Whisk in the lard, cocoa powder and sugar until thoroughly combined and then remove the double boiler from the heat. Line a 9×9 inch baking dish with parchment paper and line the bottom with the remaining ¼ cup of chocolate chips. Pour the fudge over the top of the chocolate chips and smooth with a spatula. Place the dish in the freezer and allow fudge to chill for 1 hour. Remove the fudge from the dish by the parchment paper and cut the fudge into 1 ½-inch cubes. Full disclosure: This giveaway is jointly sponsored by Paleo Parents, Victory Belt Publishing, and gfe, but opinions expressed herein are strictly my own. I am interested in going Paleo and having a book full of pork recipes would definitely help getting my husband on board! I am a fan of gfe on Facebook! I am a fan of Paleo parents on Facebook! My interest in these books is to learn more about the Paleo way of living and to hopefully find enough recipes to sway my husband over to trying this. Shirley – the fudge sounds divine! I too would use butter. We are huge pork lovers in this house as well. And bacon? Can’t live without it! I do have some days in the week where I try to be conscious of not eating any grains…I think it is a healthy choice for the body as well as eating vegetarian once or twice a week too. I love Paleo Parents and would be interested in owning any of these books, but especially Eat Like A dinosaur – my kids would love it! I’m a fan of Paleo Parents on Facebook! I’m a fan of gfe on Facebook! My teenage son has had health issues his whole life and we have modified diet all along the way to help him improve. 2 years ago he became much more severe and was going down hill, despite eating healthier than the standard american diet. Finally this fall he was diagnosed with celiac, which limited his diet even further. It is a work in progress trying to figure out which foods he can and cannot eat, because it goes beyond simply gluten-free. I am currently exploring various Paleo cookbooks and would love to add any of these to my collection. I already liked Paleo Parents on FB and that is how I found out about you. 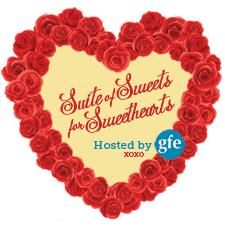 I just liked gfe on FB. I’ve been a huge fan of the Paleo Parents for quite some time now. I have a copy of their Beyond Bacon and 3 Phase Paleo books already. Last year for my birthday, I made their Holiday Bundt Cake (it was to die for). One of my other favorite recipes is their Spaghetti Squash alla Carbonara. I’m a fan of Paleo Parents on FB. I’m a fan of gfe on FB. My family eats paleo-ish already – I have seen both Beyond Pork and Eat like a Dino and LOVE them! I would love to have either book to add to my recipe repertoire. This giveaway sounds awesome! We are constantly raving about the benefits we have experienced from Paleo. This giveaway is the perfect way to share (food & literature!) with our family and friends! I like gfe on facebook!! Would love to win this as I am a Bacon junkie. I am a long time fan of the Paleo Patents but sadly do not own any of their books 🙁 my family has been 90%Paleo for a year and a half and this mama has never felt better. It can be challenging at times with a tween & a picky toddler, but sites like yours & theirs make it easier to make “normal” foods that they can eat. I am a FB fan of both sites, so I hope I get picked. I could really, really, really use Paleo cookbooks. Thanks! Would love to get my hands on any of these prizes to help us with our adventure. Thank you! I already LIKE gfe on FB but did go click “get notifications” darn FB and their tricks, grrr! already LIKE and get notifications for Paleo Parents, that is how I heard about this giveaway!!! I LOVE following the Paleo Parents! I really need to pick up their books because, although I have been following a paleo lifestyle for several months now, I need some help transitioning my family. My seven year old daughter has a history of digestive issues and is currently experiencing some challenges. I think that ELAD would be perfect for helping her understand how diet can help her feel better. Like Paleo Parent on FB! Liked GFE on Fb too! I am excited to actually fully dive into paleo. I feel like I have been working toward it over the past few years, but still held on to a few things (namely rice crackers and york peppermint patties, ha), never going all the way. I was diagnosed with celiac 12 years ago, and feel like this could be the last step I need o take in really healing my poor stressed-out gut. I WOULD LOVE THIS COOKBOOK ON PORK. I EAT BACON EVERY MORNING AND ALOT OF PORK DISHES. I AM MOST INTERESTED IN LEARNING MORE FROM PALEO PARENTS. What a wonderful giveaway. I’m interested in trying the bacon jam; it sounds delicious. I would love to win this. I love to be in on the planning of our family meals and how they relate to our overall nutrition and well being. Still transitioning to full Paleo. Would love the bacon book in particular but all will help as I keep eating Paleo which really really makes me feel so much better and I know improves my health! Seriously trying this fudge! Would love to win any of these books! I love Paleo Parents blog. While I don’t have kids, I bought my sister Eat Like a Dinosaur for her family. She really enjoys the tips on how to get the kids involved in cooking! I’m a fan of the Paleo Parents on Facebook! I’d love to win to expand my knowledge of paleo for my family and myself! Love Paleo Parents and GFE! My son, who has autism, recently asked to start eating like a dinosaur after watching me go paleo. We’ve been gluten and dairy free for a while, but he still doesn’t feel “well” very often. Would love to have some more tools at my disposal! I am getting married this summer and am interested in cooking paleo for my husband and I, and for our family in the future! Now I need to stock up on some good reading and recipes! New to the Paleo lifestyle and can use all the help and recipes I can get!!! With recipes like these it doesn’t sound like I’m going to miss a thing!! I chose a paleo diet to get rid of my acne and chronic joint pain. And I’m a fan of paleoparents on facebook! I am already a fan of Paleo Parents and have their 2 latest books–would love to win a copy of beyond bacon! I “liked” the Paleo Parents a long time ago on FB 😉 I also follow them on IG. I live in Virginia as well – I’m too far away to come to their meetups, but I was at their book signing for Beyond Bacon in Northern Virginia! I’m passionate about pork. Beyond Bacon would be a huge hit at our house. I have rendered my own pork fat and need more ideas on how to use it. My husband always jokes about how I eat way more meat than all the other wives. I would totally win a contest! I have three girls who can pound down the meat as well. I will pin this and like it! Love Stacey’s podcast and pins. I am fairly new to the paleo world and would love a cookbook to inspire me! I like Paleo Parents on FB. Like very much! I love pork, too! I could live without beef, but not pork. I’d love to have any of the Paleo Parents’ books. They are an inspiration to me. I Like Paleo Parents on FB! My kids want the “Eat Like a Dinosaur” really bad! I want to get more pork into our diet. Been transitioning over the last month and my kids LOVE pork!! Fingers crossed!!! I am a huge fan of Paleo Parents…and bacon jam!I have some in my fridge right now. I have Beyond Bacon on my wish list, but I’d love to win it! Pig is probably my favorite meat to cook with and I’d love to fully explore it! I AM JUST STARTING OUT AND REALLY TRYING TO STICK T THIS DIET. I NEED SOME TOOLS TO GET THE REAL BENEFITS. Thanks for the giveaway! I don’t know much about the cuts of pork, so thought that was great they included it in their book! Beyond Bacon is a book I’ve wanted for a long time! Thanks for the giveaway! I am a huge fan of the Paleo Parents. It’s because of Stacy that I found the Paleo/Primal lifestyle, and am doing so well on my healing journey. Giving up all grains, not just those containing gluten, has been tough, but so worth it! We have been following the paleo lifestyle and could use any extra recipes possible! My two children would love to win the Eat Like a Dinosaur book 🙂 thanks!! And I follow both sites on Facebook!! I would love either of the hard copy cookbooks. I’m just “getting back into” bacon after years of fat phobia. I’m really lovin’ real, quality bacon again! I’m a facebook fan of gfe and also Paleo Parents. I have an autoimmune disease (Hashimoto’s disease), and am new to gluten-free and paleo dieting. Could really use all the help I can get, especially with recipes for my kids!! So far they now ask me “Does this have gluten?” because they don’t love the things I have tried so far. My family of 5 made the switch to paleo recently after we had testing done on the kids and realized that they were allergic to everything. My youngest is allergic to all dairy, soy & whole wheat. My middle child has ADHD & is allergic to all whole wheat, wheat gliadin, wheat gluten & spelt. My oldest has a kidney disease & is allergic to dairy, eggs, soy, all the grains, peanuts, sesame seeds & sugar cane. So as you can see that basically is a Paleo diet. We’ve already noticed some results but I need a lot of help I’m desperate to figure out different recipes that we can eat but also on a lower budget. Not too mention I’m hoping to lose some weight & get healthier myself. I would love to win a book to help me on this new lifestyle. I would love to learn more about pork cooking. We regularly use bacon and ground pork, but don’t venture much outside of those cuts. I am a fan of PP on FB. 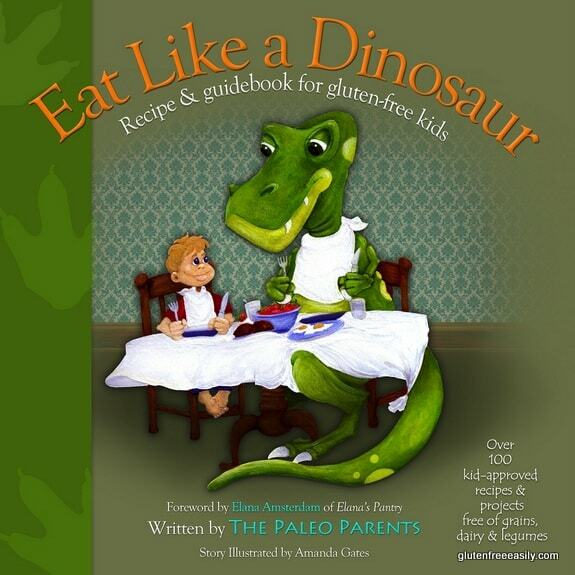 Love Paleo Zparents & their Eat like a Dinosaur book. Can’t wait to read the others! I would LOVE any of these books. I currently have Beyond Bacon checked out from the library. Thank you for sharing this. I have been looking for a good family Paleo cookbook. I love eating paleo and I want to make it easier for my kids to join me! I am a fan of GFE on FB! I am a fan of Paleo Parents on FB! I am a huge fan of the Paleo Parents and would really like any of these books! Pork is my family’s favorite meat and Ihave 4 children I would like to know the best way to transition to Paleo – so any of the books would be awesome for me! Thanks so much!! I was diagnosed last year with PCOS. My doctor told me in order to relief my symptoms to go low carb and gluten free. I took it one step farther and I’m trying to eat Paleo as much as possible! Its been a struggle trying to find GF and Paleo foods that both my husband and son would enjoy, but hopefully I’ll win a book and make recipes that they will love!!!! I recently realized that I’m gluten intolerant. Would love to cook from this book! I’m interested in finding more paleo recipes. I am relatively new to this type of eating. I would love for my family to start eating this way but it starts with me finding kid friendly recipes that the whole family enjoys. I’m excited to know that’s there are resources like this available! I have psoriasis and of recent discovered by going gluten free it has been the best ‘cure’ thus far. There is no medical cure for this, but going natural is a amazing thing. My hands at one point were so clear you wouldn’t know I had this problem. But having fallen off the gluten free more than I realized for it is so easy to break new habits, my hands are once again worse than fish scales. So, I am all happy to find food that I can enjoy at the same time it’s helping my disease. We are just starting on Paleo after years of determining the reason for my husbands health issues. 1 week after starting with Paleo my husband has lost 6 pounds (something he was never able to do before) and feels better all around. I would love some help with recipes and insight. I’m also super excited about the kids book coming out so I have some ideas on what to feed my kiddos. Interested in all of the resources! I’m a newbie to eating gluten free. My children are having a hard time adjusting. I’ve has my eye on ELaD for a while now for healthy kid friendly recipes. Would love to win it!! SOrry…I likePaleo Parents on Facebook. I love this book! I want to win! I liked the Facebook pages and clicked on ‘get notifications’! I have liked Paleo Parents on FB. I have to eat gf and have a hard time mixing it up and finding recipes for my whole family to enjoy. Would love these books to help me!! I love the GF Recipes on FB.Haven’t tried them all yet but working on it. I have just begun to hear of the paleo diet and want to know more. I was eating such junk and now since Herbalife I have lost over 20 lbs and 4 pant sizes and I am still losing! I still need to find better ways to find my children and we are all learning together. My son has asthma and 1of my daughters has tummy issues and another 1 of my daughters has eczema. We need to learn foods that can heal! I’m trying to convert my families diet to paleo and gluten free to see if it’ll help with the fibromyalgia pain for my fiancé and my migraines. We’d love any and all of these books to use in our kitchen and our lives. Hoping to live a happier & healthier life! I liked both pages and will be getting all their notifications. I liked GFE and will bet all notifications! I liked Paleo Parents and will get all notifications! I have been fans of Paleo Parents and liked their site on FB a while ago. Liked GFE on FB! So glad to have learned about your site. All three of these books seem very interesting. I’ve been gluten sensative for 7 years, but as of late, even a smidge seems to set me off. Although I don’t have kids, I have a fiance, and it would make our lives simpler to convert completely! And I LOVE (even more than chocolate) bacon! Need all the help I can get. My 4 year old was just diagnosed with celiac disease and gastroparesis. Our entire family is going gluten free becasue she is so severe. We will all get healthy with her, including our 3 year old. Hopefully paleo/gluten free will prevent her from getting a feeding tube. Please please pick me!! I could really use this book . 1.becaus I’ve just learned after 5 wks of relentless research and trial and error I’m allergic to gluten … Wow how I’ve been shocked at everything I gotta cut out of my diet, but also happily surprised to learn it’s not the end of the world . 2. I love bacon ! Who doesn’t ? So all these books will benefit me, help me and give me piece of mind knowing there’s plenty of better options out there going gluten free . And my nephew would love the book .. There are three generations in our family interested in eating paleo way. These books would be a great help! I am delving into paleo and am not yet allergic to bacon. I love bacon! Who doesn’t? Am needing some new recipes and new meals for my family. Love your reviews of these books and look forward to trying the recipes out. I am a fan of Paleo Parents and have dabbled in Paleo but really need to be more strict with it along with trying to feed it to my family. Already follow GFE on FB. Already follow Paleo Parents on FB. I was recently diagnosed with Celiac disease and I want to heal my body and take a more active role in my health. .and I think these books will be a great start 🙂 So thankful for guidance! Yay! I won 3-Phase Paleo! Thanks to Shirley for the contest, and to Stacy and Matt for writing the book! I received an email that I won (whoohoo!) and to leave a follow up comment. So excited. Thank you! I received an email saying I won ELAD! So excited! Woooo!!! I won ELAD!! I’m so excited! Thank you so much GFE! I got my stepson to eat spinach this weekend an now I can get more veggies into his diet. He even said he would “try eating like a dinosaur if it’s yummy”! !